E mboldened by their victory at Lexington and Concord, the colonists went on an offensive to the north in an effort to capture the British strongholds of Ticonderoga and Crown Point, with the eventual hope of taking Canada from the British. Meanwhile, the fighting around Boston continued. In June 1775, the Continental Army beat back a British offensive at Bunker Hill (Breed's Hill). Although the Americans eventually had to retreat from the hill, the British lost control of Boston the following spring. Having left Boston, the British planned to take New York and cut the southern colonies from New England, a classsic strategy of divide and conquer. 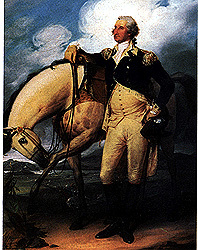 General William Howe faced General George Washington faced each other in the Battle of Long Island on August 27, 1776. Beaten badly, Washington quickly retreated back into New York City. 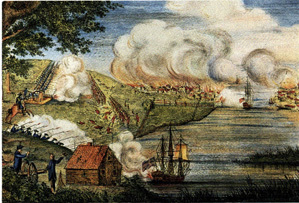 The Redcoats followed and a second major battle took place in Harlem Heights. Still outnumbered, Washington fled north into White Plains and then south to New Jersey. Howe vigorusly pursued Washington into New Jersey, capturing Fort Lee on November 20, 1776. For a whole month, the British chased Washington as he retreated into Pennsylvania. From his safe haven in Pennsylvania, Washington decided to ignore European military custom and launch an offensive on Christmas Day. 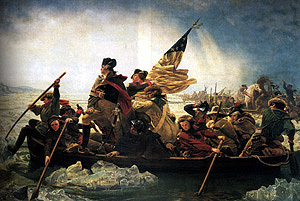 On December 25, 1776, Washington crossed the icy Delaware River with 2,400 men to attack the largely Hessian British force camped in Trenton. Having totally surprised the Germans, most of whom were drunk, the Americans captured Trenton in little more than an hour with relatively few casualties. Instaed of occupying Trenton, Washington decided to return to the safety of Pennsylvania. Upon hearing that the British had now split their forces in southern New Jersey between Trenton and Princeton, Washington ordered another offensive across the Delaware. As Washington closed in on Trenton, the British forces in Princeton moved down to meet the Americans. Washington then maneuvered a large force around his right flank. Ths force quickly moved into Princeton, which by then was being defended by a skeleton British force. Having routed the British twice in southern New Jersey, Washington moved north to make his winter camp at Morristown.